Rediff.com » Movies » Suriya joins the circus! Get your low down on what's happening in the Tamil film industry, right here! After the stupendous success of Ghajini in both Tamil and Hindi, A R Murugadoss is making his next Tamil film with Suriya and Shruti Haasan. Suriya plays a circus artist in the film titled Ezham Arivu (Seventh Sense). Reports have it that the actor is doing his own stunts. Shooting of the film is going on in Coimbatore. Suriya, who has learnt many tricks, plans to show them 'live' to the people once the shooting gets over so that they will know it was he and not a 'dupe' who did all the stunts. The film is produced by Udhayanidhi Stalin's Red Giant Movies. Mani Ratnam who rarely makes public appearances at audio and movie launches made an exception for Kannan, his assistant. 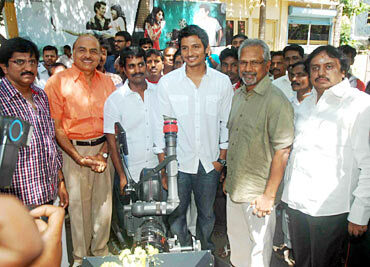 The camera for the first shot of the film on Jiiva was also operated by Mani Ratnam. Vandhaan Vendran, a romantic action thriller set in Mumbai stars Jiiva and Tapsee Pannu. The film launch was at the AVM studios. Young actor Arya, fresh from the success of Madrasapattinam turns producer with his next film Boss Engira Bhaskaran. Arya's newly launched production company -- The Show People -- will present Boss that stars Arya and Nayantara in the lead. The film is marketed by Udhayanidhi Stalin's Red Giant Movies and is directed by Rajesh of Siva Manasulla Shakti. The music of the film is by Yuvan Shankar Raja who couldn't make it to the launch. The album was released by Suriya and accepted by Harris Jayaraj.